Cutipie Marzia (Marzia Bisognin) posts her last video on YT bringing her fans to tears. But as a content-creator Marzia is quite different from Felix. When Felix’s channel had game-plays, lot of shouting, swearing, drama, comedy on the other hand Marzia’s vlogs were the most calm and peaceful. Watching Marz was never felt like a conventional one- where the host tries too hard to be funny, relatable, entertaining. As far as I have watched her videos- they can be divided into a few categories. Trying out beauty-products: Marz tries out different kind of beauty-products in front of the camera, sometimes for promotional purposes. Her videos do not look like tutorial made by the so-called beauty-gurus. Her look is simple and elegant- the kind of look girls with a taste in fashion would go for- nothing too bold or crazy. Trying out dresses: This came into picture because as viewers we absolutely love her dressing sense. Also more recently, she launched her own clothing line, she has designed a bunch of stuffs. Marzia-makes: This was the series where she would make simple dishes in front of the camera- like yogurt popsicle, focaccia bread, pancakes, popcorn, milk-shake etc… None of the videos are the best of learning how to cook- but we as her fans love everything she does. Melix-plays: This was the series where Felix and Marzia would play video-games or do stuffs. Notes: If you have been to ScrapBook before, you might have seen that I set some monthly goals for each month which I revisit at the end of the month. The credit goes to Marzia and Lilly (Superwoman). The “notes” term is used by Marzia where she talks about a few stuffs she wants to do in a month and she records herself doing those things. Travel-vlogs: These are the best I would say, the music, the editing… everything is so soothing. Animations: There a few videos which are animated by her, like pugatory (with the 2 pugs Maya and Edgar as the main characters ) and draw-my-life. Marzia’s videos are not for those who like scripted entertainment. Marzia is not a beauty-guru/ a professional cook/ a pro traveler/ a pro entertainer, she is an artist. She has captured bits and pieces of her life and shared it on the internet and internet has loved it. Marz admitted in one of her videos that she is a shy and introvert. She felt weird to sit in front of camera and talk to it all by herself, she got used to it with time… Watching her videos, I have always wondered about her perfect life… She is such a talented person… she’s following her dreams, she is into arts and crafts, she has a loving and supportive boyfriend. I cannot tell how many times I shout GOALS while watching her videos. But it is not always what it looks like from outside. Marz left her home and country when she was about 18. She came to Sweden to live with Felix whom she met online. Marzia started to talking to Felix as a fan and very soon they decided to be together. Both of them had to communicate in English as Felix was Swedish and Marz an Italian… When Felix was a peak of his career on YouTube, Marzia was with him. She traveled with him, held his hand in public… but somewhere she didn’t feel herself deserving the attention. Also for moving out to a different country, her education was discontinued, she had no friends, she became dependent on Felix… In her last video, she talks about her feelings back at the time when everybody of her age either had a job or was going to university but she could not do any of that. It took a lot of time and effort of her to open up to people, to seek guidance and friendship and luckily it happened at last. 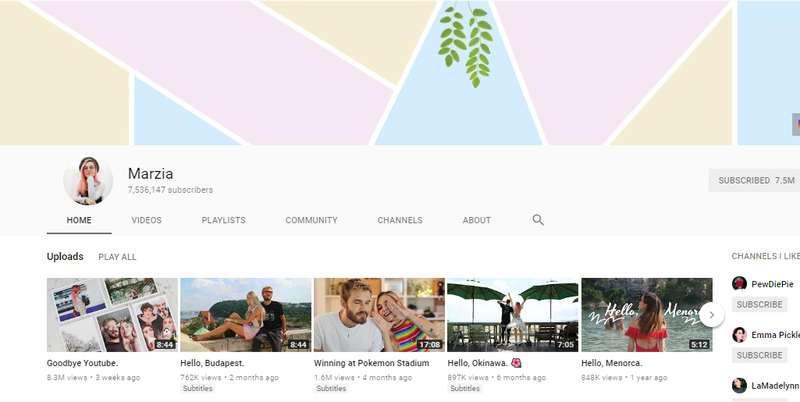 Marzia started her own YT channel… she got her own little world. She has blog as well. In her videos she had never talked about this struggles, her feelings. For the outside world, for the fans, for everyone- her life was as perfect as her instagram pictures. Truth be told, what would have happened if she had shared her struggles where she was into it. There are a lot of stuffs that happen in our life which are completely out of our control. Ranting about those problems over internet would not serve anyone. Marzia is 1 and a half years senior to me but I am amazed to her maturity. She has always kept the problems of her life away from us. It was definitely a great step to take herself away from YouTube, over 7 million loyal fans. Not everybody can take such a bold step. She is moving towards betterment of her life and passion, she wants to explore her capabilities in different field- I totally appreciate that. Many people interpreted her leaving YT as burning out of a content-creator or mental issues and depression. Her boyfriend has addressed those comments and confirmed it was not about mental health. She just wants to move on with new opportunities which a lot of YouTubers fail to do. Felix supports her in this decision. Her taking down the videos that she uploaded over the years was saddening but she has all the rights to embrace her personal space. Marzia is co-founder of Tsuki market (clothing line) and founder of Mai accents (fine jwellery ), she found interest in pottery as well, she would continue to work on those projects. I would definitely miss her watching but I do wish her a great future ahead.